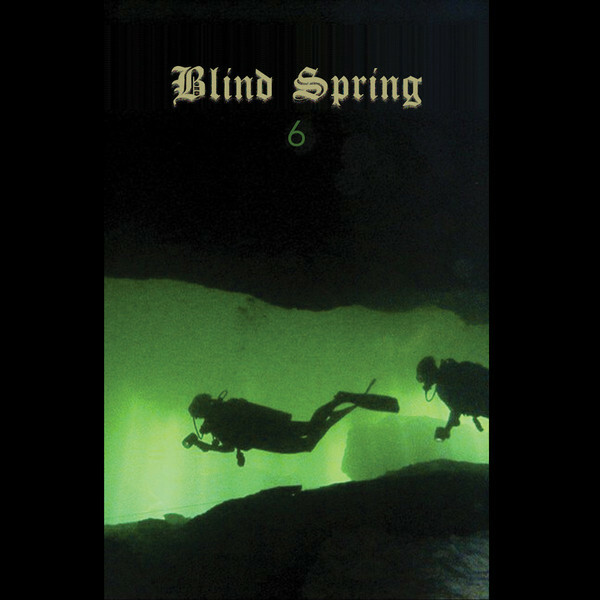 2016 debut cassette from Cleveland’s Blind Spring, featuring members from several other groups, including the Red Sparowes, Terminal Lovers, Keelhaul, and the experimental jazz project Lost Head. Deep sea divers experience a condition called nitro narcosis, an altered mental state that arises from breathing air in a high pressure environment. This cassette sounds what that must feel like – a strange, hallucinatory aquatic voyage. “Pilotage” (T1) opens with underwater echoes and distant melodies; later, electronic sounds appear from the depths like fluorescent sea creatures. “Open Circuit Buoy” (T3) is a 15-minute piece that begins with a dark beat-driven section that opens up into a gorgeous jam, with layered guitars, steady drumming, and an abrupt sample at the end. “Rebreathe” (T4) is another long-playing (25 minute) highlight that plunges to the darkest depths – there’s haunted piano, theremin-like bubbling, electronics with the bends. The cassette ends with “Nitro Narcosis” (T5), with drumming, bells, and electric keys finding a quiet, unhurried groove before fading away.